When we think of the military, we don’t exactly think of singing and dancing sailors bouncing down the street to a funky beat. Visions of Guys and Dolls, with sailors belting out show tunes, might come to mind. You might remember watching young actors performing awkward choreography to a tin-keyed piano on a high school stage. But a funky beat on a real city street? We know all the words, so when this fantastic music video starts we start bobbing and weaving to the beat. You’re hearing Mark Ronson’s hit song, “Uptown Funk” and life is good. Life is still good, but what you’re really hearing is a parody version of the hit song. 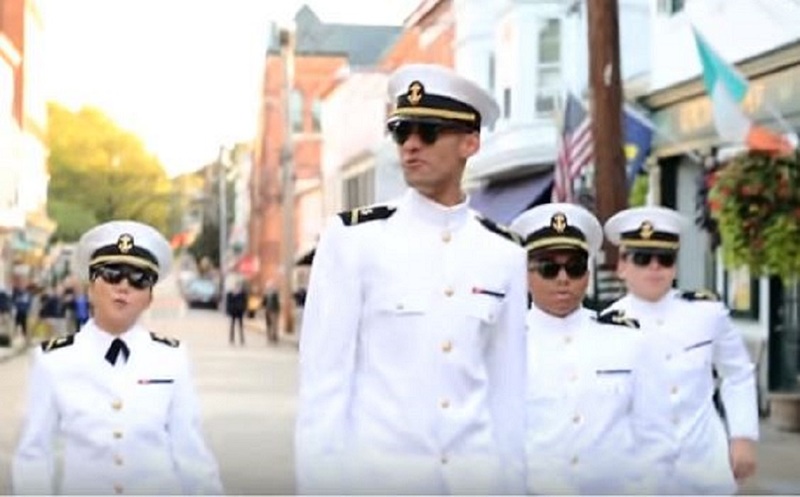 Led by Midshipman 1st Class Rylan Tuohy, a group of midshipmen from the United States Naval Academy in Annapolis, Maryland created the viral video. And they created this masterpiece on a zero budget! The Saturday-morning production took place on Maryland Avenue in the state’s capital, on a cobblestone street packed with shops, diners and bars frequented by tourists, locals and mids. Wherever I’m stationed, wherever I’m deployed, I’ll find a way to keep the videos with me to show off what we’re doing. Tuohy is the brains behind several other Navy videos — known as “spirit spots” — that were created to cheer on the Navy football team in their longtime rivalry against Army. “We Give A Ship” and “Helm Yeah!” are awesome in their simplicity. Deployments are hard on soldiers. They deserve a break and a chance to blow off some steam, right? The Army and the Marines have created their fair share of hilarious parody videos. In Kunar Province, Afghanistan, “Call Me Maybe” by Carly Rae Jepsen seems to be a popular choice. The Army version was uploaded to YouTube on Aug 19, 2012, and has almost 4 million views. The Marine version was uploaded on Jul 18, 2012, and has been seen by almost 3.5 million people. Wouldn’t it be awesome if we could just have dance-offs instead of wars? Enjoy our wonderful soldiers and sailors in the videos below as they sing, lip sync, and dance. While the videos may be a few years old, they still exemplify the unity of our military forces and exhibit a celebration of life under sometimes extreme circumstances. Below is the Call Me Maybe Cover by US Army soldiers in Kunar, Afganistan. Here is Marine Corps version of Carly Rae Jepsen’s hit song. Another great one here, to leave you on just the right note! These viral videos aren’t just great, they are great for morale. Enjoy and pass them along to your friends, every view they get has to feel great!